The Swiss Alps 100 160KM is a beautiful course which runs through the valley, along ridges and over Swiss alpine passes, 3 suspension bridges, one dam, and along many small lakes. It’s a challenging ultramarathon course mostly on single trails and fire roads. Starting in Münster at 1’327 m.ü.M. (4,353 feet) the course begins with a gradual downhill on farm/fire-roads and single trails. After the Niederwald aid station 160KM runners split from the 100KM and 80KM course and move towards the village Bellwald and towards the first suspension bridge Aspi – titter. From that bridge follows a tough uphill to the Gletscherstube aid station. The next 6KM runners will run alongside the 13-mile long Aletsch glacier which is one of the most beautiful spots to run at in the Swiss Alps. Soon enough the Riederfurka aid station is coming up. The next 5.5 miles are going to be a tough uphill to the highest point of the race. Along the way, they also cross the Bellalp – Riederalp suspension bridge. Once a the highest point of the course, at 3’014 meter, the Sparrhorn has incredible views to the Aletsch glacier, the Oberaletsch glacier, and down to the valley. After the Sparrhorn you run towards the Riederfurka aid station again. Along the way you’ll be crossing the Gibidum dam. Once you leave the Riederfurka aid station you’ll traverse along the Riederalp, Greicheralp, Goppisbergeralp, Bettmeralp, and Fiescheralp, where the next aid station is. Now get ready for a long downhill for about 5 KM and a drop of over 1,100 meter down to the lowest point of the course. Then runners work their way to the next suspension bridge the Mühlebach – Fürgangen. Next up is “The Beast” a 1’128 meter (3,700ft) climb in only 10.3km (6.4 miles) with 14 switchbacks. On top runners find the Breithorn aid. The runners will then run over the Saflischpass to the Rosswald aid station, around the Fülhorn and then down to the Binn aid station where runners can get their drop bag if they have one. 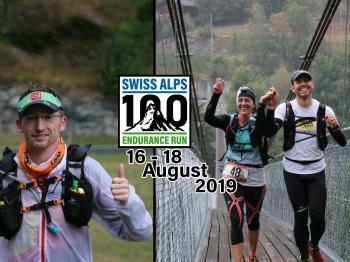 The next 25.5km (15.8 miles) traces ridges and skirts peaks along the Swiss Alps with phenomenal views down to the valleys, snowy mountain tops, and glaciers glimpses going all the way to the Stadle aid station back inside the valley. From there the remaining 13.5km (8.3 miles) are run on a slight downhills course. Once arriving back in the idyllic village of Münster, 160km will have reached their goal and get their well deserved buckle and medal. With a total elevation gain of 22’980 meter (38,700′), 160km runners will have a cutoff time of 48 hours.